Today's Indie has picked up the shooting the messenger thread, have to say it is good to see it in print. Hadn't realised Margaret C had been threatened with violence. These bullies have to be stood up to. On another forum (DforDog) there is one particular poster that I have described as Cato to my Inspector Clouseau. Without warning or seemingly any real provocation she will attack me with a frenzy - to everyone else it is completely obvious we should both be on the same side. The latest imagined atrocity to have provoked her is the scandal that there is a small photo on one of the 32 pages of our calendar (free with the latest magazine folks - click to buy on the panel at the side!) 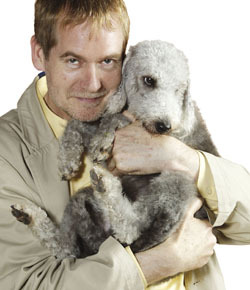 of last year's Crufts Best In Show winner - Drontal's Dog of the Year 2008. This is on one of their advertorial pages, they were our generous sponsor. Yes, I know - you're finding it hard to understand why that makes me such an obvious target for a forum assault! But apparently that is further evidence that I am a hypocrite and that's me just cashing in on Crufts positive image to sell magazines. Does rather ignore the fact that this is a calendar involving 12 enormous positive stories about pet dogs doing amazing stuff and she's just looking at an advert within it. A disgruntled ex-employee making up loads of stuff just to make the poor, old, little, multi-million-pound-turnover KC look bad. After all - I did leave under a cloud, everyone says so - so it must be true! Click here to read my blog entry where I give the full no-punches-pulled story of my life at the KC and what really happened when I left. I just can't persuade Cato to read my account of what happened at the KC, after my last attempt to get her to read it she speculated as to what my boss would make of all this.... which was a real giveaway that she still hadn't read it! You see, if she'd bothered to read it she'd know I don't have a boss. Her sidekick on the forum defends her mate's right not to read my side of the story. True, it must make life much more simple where you can blame all the problems in the doggie world on little old me! Anyone else want a fight? Just got my copy of the Independent - really good coverage which should reach many people. Why can't these dog people see how they are regarded by the majority? Bullying is never acceptable in any cause, and having to find individuals to blame shows how weak the arguments are against reform of pedigree dog breeding. If these people had valid points to argue about they wouldn't have to resort to such tactics. I just thought I would take this opportunity to congratulate you on your stance. I can't begin to imagine how hard it must have been to repeatedly bang you head on a brick wall saying the same things again and again especially when all the good breeders should be on the same side. Reading in another blog of yours I was thoroughly dismayed to hear of 'Franks' comments and can only think that the 'man' has too much time on his hands and not enough love in his heart. Please keep on keeping on Beverley.